Made from reinforced 75 mm x 75 mm (approx. 3 in x 3 in) or 100 mm x 100 mm (approx. 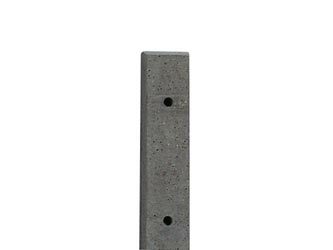 4 in x 4 in) concrete these are designed to offer greater durability than timber and is the conventional repair solution when timber posts have rotted at ground level but the rest of the fence is sound. The spur has 3 bolt holes for use with coach bolts or coach screws.